While no sock can improve your chosen sport or exercise, it can certainly enhance your body’s ability to cope with the effects. Head Performance Sport Sneaker Socks are technical sear ‘engineered to perform’, made with a special poly/cotton blend able to wick moisture, supported by woven-in air channels that help regulate the temperature of your feet. These under-ankle length Head sneaker socks have cushioned soles for shock absorption, and supportive arch panels that assist in holding the socks in place. 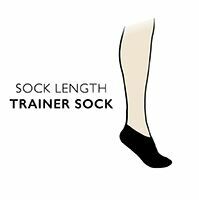 The same comfort and performance is also available in a Crew Sock length.